It all started with my wife — again. Her recent work in the Florida Keys with the National Aquarium allowed her to see a new part of the country; replete with turquoise water, key lime pie, and quirky Americana. Since Florida isn’t the top of my bucket list (no mountains, no surf…), she knew she’d have to sell me on the adventure of it. As it turns out, the Overseas Highway (a 106 mile stretch of road from Key Largo to Key West — originally built in 1928!) has a parallel bike path for more than 70% of the length. Thus an idea was born. We should ride bikes from Key Largo to Key West during my winter break from school. Tickets were purchased and I found a map (left) that detailing the islands, and mile-markers which served as a starting place to plan our adventure. About that time, Irma decided to pay a visit to the Keys, wreaking havoc on the towns and communities putting our plans in jeopardy. We thought about canceling our trip four months out, but living in a resort area ourselves, we knew how important it is for tourists to come back after a disaster. We wanted to be part of the solution, not contribute to the problem. While watching the Super Bowl in February, Janesse decided that it would be a great idea to invite her Aunt and Uncle from New England. With only two weeks until departure, they said yes. My procrastination turned into urgency when I realized that we had no accommodations, no bikes, and no mileage plan. I called Key Largo Bike and Adventure Tours to coordinate bikes. The owner was more than accommodating; not only was he able to rent us bicycles, he mentioned that he could help with transporting luggage daily between hotels. With this opportunity, I could now work on lodging. We wanted to average about 20 miles a day to ensure enough swimming, mini golf, book reading, and happy hour time each day. This worked perfectly. Day 1 we rode from Key Largo to Tavernier (Teacher Home Swap now has a teacher home in Tavernier! ): an easy 11 mile day and stayed on a houseboat at the Mangrove Marina. Yeah, that’s right, a houseboat, with a slide and everything. The riding was beautiful, a breeze at our back on a perfectly flat road. We meandered our way down though the keys. At around 20 miles per day, we spent five nights heading south through the keys. In addition to Tavernier, we stayed on Long Key, Marathon Key, Looe Key, and Stock Island before riding the last few miles to Key West. 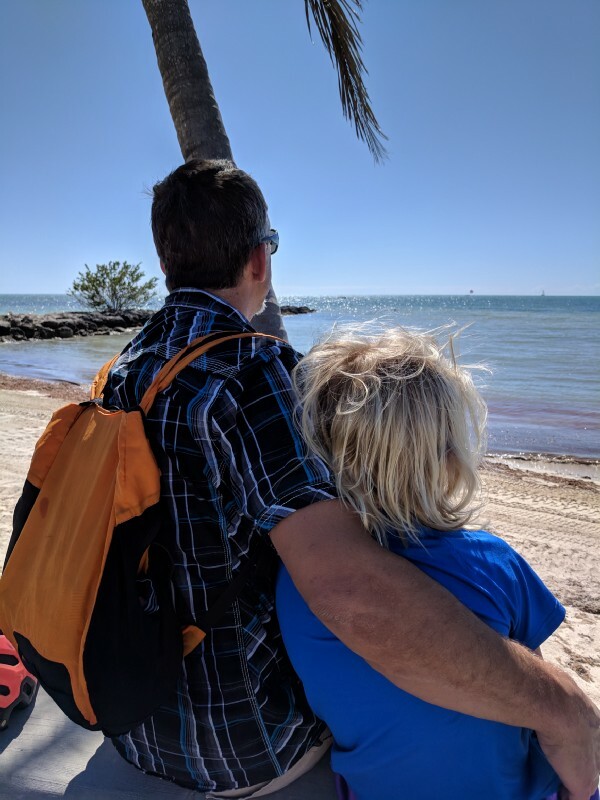 While there were no major issues riding, I must admit that traversing the Seven Mile Bridge with my ten year old son was a bit stressful. If you are unfamiliar with this bridge, it is a two-lane, 7 mile long bridge. The shoulder is wide, however it is not separated from the highway. For my son, the scariest part was hearing the large trucks rolling down the bridge from behind him. He’s a skilled rider and rode perfectly: kept a predictable line, did not look back, focused on avoiding the road debris, and made it safely to the other side. Once there, he took some time to decompress, and we were able to continue the ride. This was the only difficult bridge, most of them had bike lanes like the one pictured below. On Day 6 we made it to Key West, and them proceeded directly to Mile Zero, the southernmost place in the US. We spent two days enjoying the Key West, and then we flew home to the mountains of Colorado. 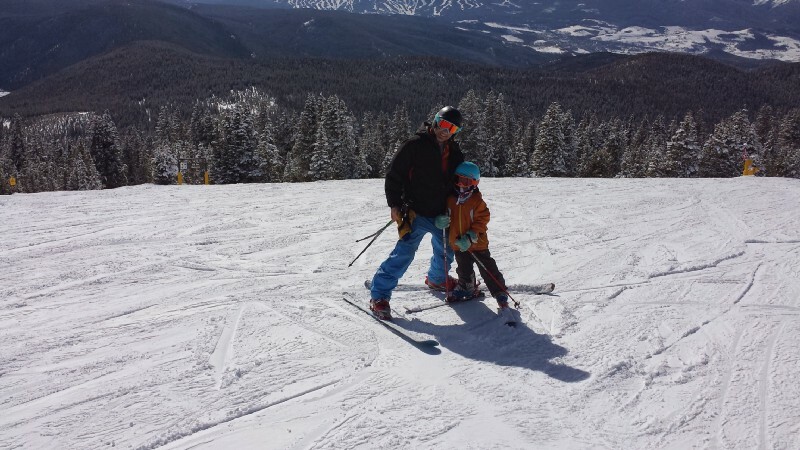 From flip-flops and bathing suits, to ski boots and parkas, we were quickly reminded that ski season was still in full swing in our little resort town. Our mountain home in Dillon is also available on Teacher Home Swap. 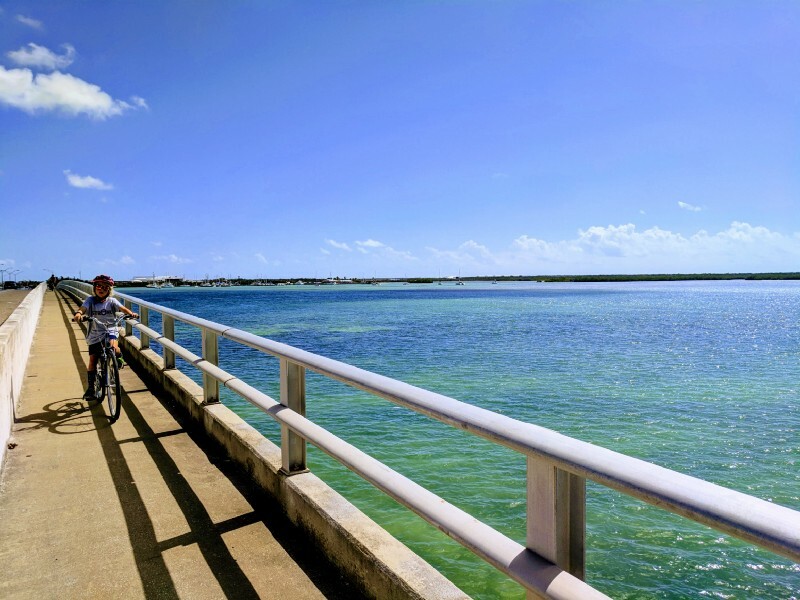 If you want any more information for riding bikes in the Keys, I am happy to share details and contact info: hotels, maps, distances etc. Feel free to connect with me at ben@teacherhomeswap.com or find us on Facebook — Teacher Home Swap.